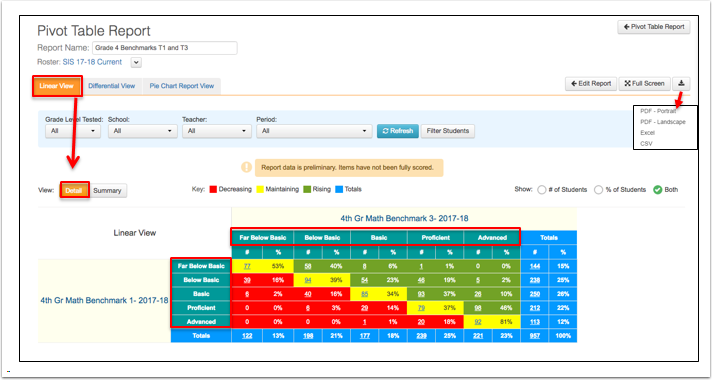 The Pivot Table Report in SchoolCity SUITE allows users to compare student performance across the same, or two similar assessments. It shows student growth, maintenance, or decline from one assessment to another by performance levels. The report(s) must be created by the user. School and District level users may keep the report private, share with other users, or make the report public for all users to view. Select Pivot Table from the tabs across the top of the Report Manager. Or, from the Launchpad, click on the REPORTS Flip Card. On the flipped side, select Pivot Table. Select the report you want to view, or click on More… to go to the Report Manager. In the upper right corner of the Pivot Table Report list, click on Create New (green). Use the drop down menus for Year, Collection, Subject, Grade, and/or Tags to select the assessments for your new Pivot Table, then click on Refresh. Note: You may select one or more in each menu. The order in which you select the assessments determines the data set order. The first administration of the test should b selected first, the next administration of the test should be selected second. The first assessment you select will be loaded in the Pivot Table as Assessment 1 (First Data Set). To reselect an assessment, click the red X to delete and start over. The second assessment you select will be loaded as Assessment 2 (Second Data Set). The Report Preview/Thumbnail displays how the new Pivot Table will appear. Save: This will allow you to close the report and return to it at a later time. You will be prompted to name the report. Save & Run Report: You will be prompted to name the report. Once the name has been saved, the report will be generated and displayed. Run: This will display the report for viewing only. You can save the report after viewing. Change Roster: Refine your search to view a different school year and roster. Linear View, Detail (default view): Other views are Summary(See Step 7),Differential(See Step 8), and Pie Chart(See Step 9). Search menus: Use the drop down menus to find results for the students you wish to view. (Options depend on your role.) Click Refresh to view the results of your search. Filter Students: Refine your search for specific students based on demographics as well as student groups. Preliminary Score: If there are items that have not yet been scored, the results will be shown as Preliminary. Show options: Show only # of students in each column, only % of students, or both in the table (as shown). Performance Level Set: The first assessment’s levels display vertically on the left hand side, and the second assessment’s levels display horizontally across the top. 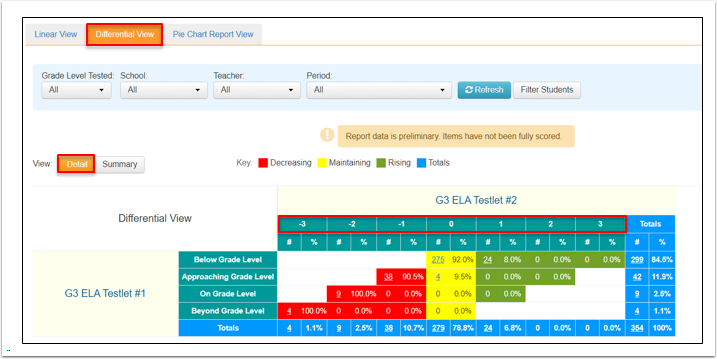 Note: Performance levels are set by the assessment creator or district template, so may vary from the example shown. Edit Report: Return to setup to revise the assessments for the report. Download icon: Export this report to PDF, Excel, or CSV format. Pivot Table Report: Return to the list of previously created reports. In the example below, on the first and second administration of the assessment, 275 students scored in the Below Grade Level performance level on both tests. These students’ scores are “maintaining” and are color coded yellow. On the first administration of the assessment, 24 students scored Below Grade Level, but on the second administration, they improved and are now Approaching Grade Level (increased one performance level). These students’ scores are “rising” and are color coded green. On the first administration of the assessment, 38 students scored in the Approaching Grade Level, but on the second administration, they scored Below Grade Level (decreased one performance level). These students’ scores are “decreasing” and are color coded red. The horizontal row totals (blue) along the right hand side of the pivot table show the number and percent of students in each performance level after the first administration of the test. The vertical column totals (blue) along the bottom of the table show the number and percent of students in each performance level after thesecond administration of the test. Click on any number in a row or column to view details about the student’s scores. If desired, these students may be grouped for extra support or challenge. Check the open box next to each student’s ID, or check the box in the header to select all students on the list. Add students to a new group or add them to an existing group, then click Save. Please see the Help documents, Creating Student Groups and Managing Groups, for more information. Performance levels are listed on the left hand side of the pivot table. Key descriptors are listed along the top of the table. The number and percent of students who are rising(green),maintaining(yellow),or decreasing (red) after the second administration of the test are shown in their respective color coded columns. Totals (blue) for each column are displayed along the bottom of the table. As in the Linear View, performance levels for the first assessment are listed on the left hand side of the table. Listed across the top of the table are numbers representing the movement from the first assessment to the next, either negative or positive. The numbers represent the number of Performance Levels associated with the assessments, and may vary from what is shown. In the center, at zero, are the students whose scores are the maintaining (yellow). Students whose scores are decreasing (red) are shown in negative numbers to the left representing the number of performance levels the student has decreased. Students whose scores are rising (green) are shown in positive numbers to the right representing the number of performance levels the student has increased. Totals (blue) along the right hand side of the table show the number of students in each performance level after the first administration of the test. Totals (blue) along the bottom of the table show the number of students in each column after the second administration of the test. The first administration of the assessment is listed in the first row, with the percent and number of students illustrated by a bar graph for each performance level. The second administration of the assessment is listed in the second row, with percent and number of students, illustrated by a pie chart for each performance level. Once saved, the new Pivot Table Report will be listed in the Report Manager under the Pivot Table tab. 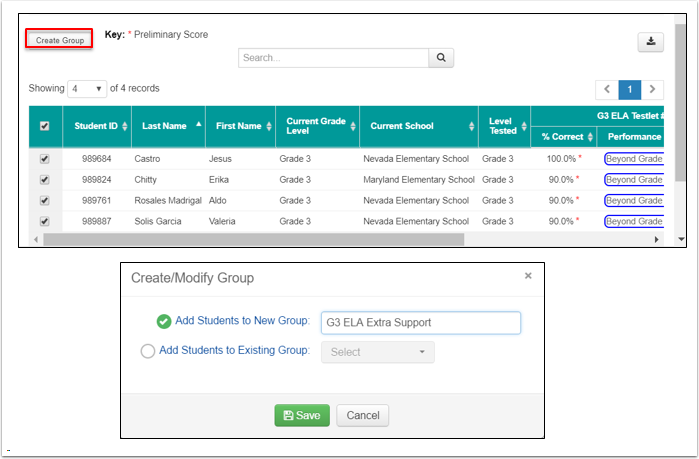 Teacher level users can only create reports that include assessment results for students on their roster. All teacher created reports are private, unless shared with other users as allowed. Teachers may View (eye icon), Edit (pencil icon), Copy (double pages icon), Share with permission (arrow icon), Delete the report, Rename it, and see its History. Bulk Functions: Select one or more reports by checking the box to the left of each, and Add Tags, Copy, Share, and Delete. 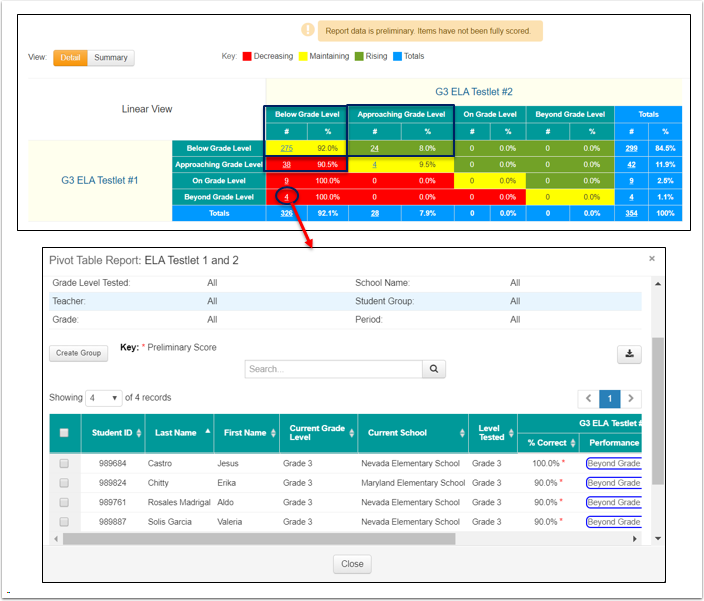 District or School level users can set the View for a Pivot Table Report to Private (only you can view it), Semi-Private (only selected users you choose can view it), or Public (all users in the district or school can view it). If a Pivot Table Report has been made available to you by a District or School Level user, it will appear in your Report Manager, Pivot Table tab, without an open box on the far left. You can only view (eye icon) and copy (double pages icon) it. You may not edit or share the report.